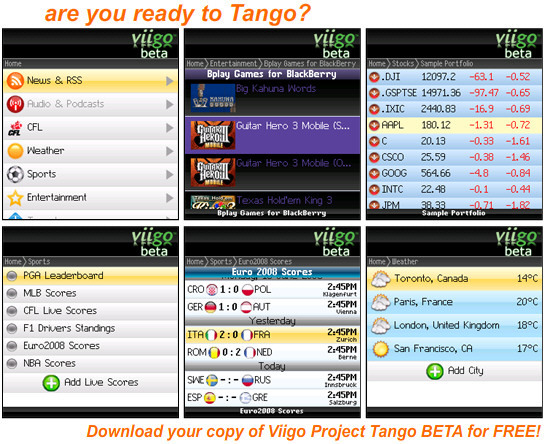 Viigo Project Tango Public Beta Now Available! Private Beta - launched yesterday, some 2,000 beta testers will put the newest features through their paces. Public Beta - available today, this beta is open to everyone! As of right now the Private/Public Betas are running the same code base, but the Private testers will be getting new features shortly (ie. Audio) which will make their way to the Public beta a few weeks later. You can expect to see 2 or 3 versions of the beta before the final release hits and Viigo will automatically notify you when a new version becomes available. Unfortunately, the beta won't carry the CrackBerry.com branding, so if you want to go beta you'll have to sacrifice that for a few months. Don't worry though - when the final CrackBerry.com Edition of Viigo 3.0 is released it'll be backed with some sweeeeet schtuff you won't find anywhere else. CFL – a sample of what’s going to be possible on Viigo’s Expanded Sports Service (league news, standings, live scores, ticket sales, etc.) … will eventually become part of the sports folder, but it’s separated right now for technical reasons. Weather – 5 day forecourt favorite cities … lots more coming here too including radar, etc. Stocks – a very very early sample of a portfolio service, showing updated market data for a sample portfolio of commonly held stocks … lots more coming here, including the ability to manage your own portfolios, and get much richer data than is currently shown. Beta Feedback – the ability to submit Bugs, Features Requests or UI Requests directly to our Product Management team right from within the app.